If you want to snap up an auction bargain in the next few months, you’ve only got a few more days to do it. Right now there is still some dealer stock which dealers need to turn into cash before the year end. But the fleets are mostly happy to stick to within £100 of their reserve prices knowing they can and will get more for the cars in January or February. The 99V Focus 1.8 Zetec with Climate Pack was very clean indeed for its 84k miles. I’d have said £3,500, but thought a private buyer might get run to £4,250. It didn’t happen. Someone got the car for £3,450, which is £300 less than mileage-adjusted trade book. How often do you see a Mazda Premacy at auction? (Mazda’s ultra-reliable Scenic sized MPV.) This was a 2001Y 1.8GXI with parking sensors and a low 11,400 miles. It sold £6,050, bang on book for a 30k miler. A 38k mile 99V Nissan Micra 1.0 Inspiration sold for just £2,150, maybe because of its bright yellow paint. A 107k mile 95M Peugeot 405 1.6GLX was reserved at £100 and sold for £200. A 133k mile 96N Subaru Legacy 2.2GX saloon sold for £400 (unless I mis-heard). 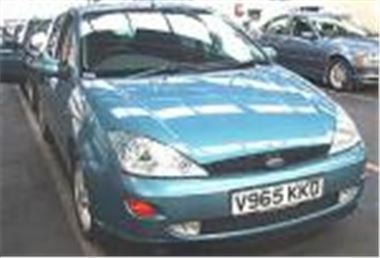 In comparison, a 67k mile 2001Y Mondeo II 1.8 Zetec was on the dear side at £5,450. New-shape Renault Megane values are holding up. All 03 reg, a 6k mile 1.4 Extreme Sport (3-dr) sold for £7,300, a 13k mile 1.4 Expression 5-dr sold for £7,400, a 12k mile 1.4 Dynamique 5-dr sold for £7,750, and a 5k mile 1.4 Dynamique 5-dr sold for £8,300. I figured £17k for a 79k mile 2001Y Mercedes E320 CDI Avantgarde 7 seater estate. It bid to a provisional £16,800, so if that’s a car you’re looking for, check out www.auctionview.co.uk to find our when it’s next driving past the block. Probably Friday. And you still get surprises. The last thing you expect in a part-exchange clearout sale is a pristine, only-just-serviced, 35,000 mile 1984 Ferrari Mondial (very nearly 20 years old). But there one was, and strong bidding took it to Sold for £8,900. More big sales at Blackbushe on Friday and Monday. Monday also sees the last Top Car sale of the year.